Nice is the Côte d'Azur's vibrant capital. Cannes and St-Tropez vie for your attention with their dazzle, but Nice is a proper city - buzzing all the time, not just during celebrity season. If you want to holiday somewhere where there's always something to do, there's glorious, sunny weather, a bright blue sea and the opportunity to people watch in the perfect setting, then Nice is for you. And it's a melting pot, here you'll find your regular Joes and Joesphines as well as well-heeled holiday makers and celebrities, so as you'd expect there's an excellent array of choice when it comes to picking the best places to stay in Nice. 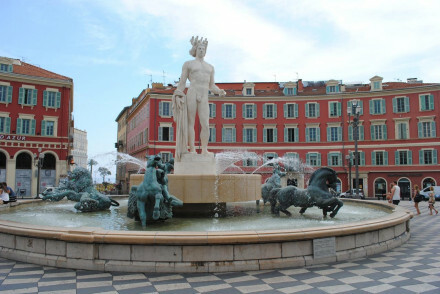 Nice has been a resort since the 18th Century, when English consumptives were treated to this town's reviving atmosphere. As well as the sunshine and, albeit, pebbly beaches, people also came for the old world opulence, which is at its most glorious in Vieux Nice - the old town - which has hardly changed since the 18th Century. The Promenade des Anglais - named in deference to these trailblazing holiday-makers. The charming area around it is one of the best places to people watch, as well as a great place for a spot of shopping or a leisurely lunch - Nice boasts some of the finest restaurants in France. Shopping and food are one of Nice's great combinations, there's plenty of market food and local produce to sample. The Cours Saleya market and the Marche aux Fleurs are the most famous. If art is your thing then there's a number of museums to visit. The Chagall Museum has the world's largest Chagall collection, for example and Nice also has a Picasso and Matisse museum, and the museums of Fine Art and Modern Art. Nice is also the kind of city where there's always something going on. And the nightlife is lively. So it's a great choice for sunny city break. The Hotel Guru's selection of the best places to stay in Nice varies from small B&Bs to inexpensive hotels in the centre of town. Use our guide and start planning your break! 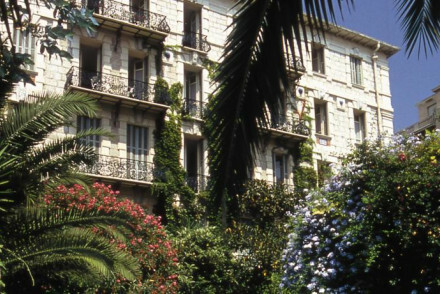 Charming and discreetly elegant, the Hotel La Perouse is just back from the Promenade des Anglais and has beautiful views of the Baie des Anges. 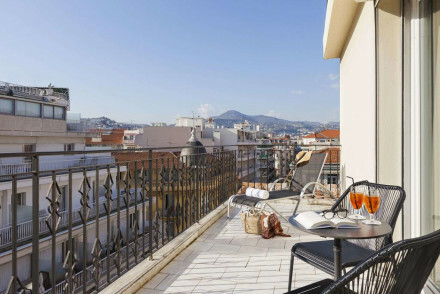 The Hotel Gounod is right in the centre of town, and has stunning views of all of Nice from its fabulous rooftop pool and restaurant. They also have a spa and private beach. Right in the heart of the old town, and especially Belle Epoque pretty to boot, the Villa Rivoli is well located and has access to a private beach. The reason rooms start from around £70 per night is because some of them are quite small. Fun and quirkily decorated by local artists, the Windsor is in a great spot for both the beach and Nice's highlights. It's also got a great spa and small hammam. Le Castel Enchanté is a bougainvillea-clad Italianate villa with a lush garden, a small pool and beautiful sea views. Provencal in style, its four bedrooms offer excellent value and privacy. The Villa Kilauea sits on a quiet hill with great views of Nice and the bay beyond. There are just four rooms, a gorgeous pool, and beautiful grounds. But you do need a car. Sometimes self catering is the best option, and Nice is full of great properties. For a full list, visit our online partner, Booking.com. Nice-Côte d'Azur Airport is a large airport with good links to the UK and other European destinations. A taxi from the airport to the centre of town will cost you about €30, or you can catch the shuttle bus for around €6. Some people arrive by cruise ship, or their own yacht! 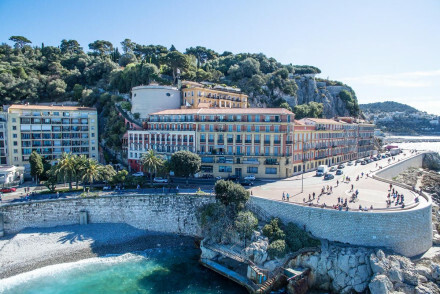 Alternatively the train journey along the French Riviera is glorious, and you can catch the Eurostar via Lille or Paris, or even try an overnight train from Paris - book a couchette - all the way to Nice. If you want to hire a car - which is useful if you’re staying in Nice and you want to see more of the Côte d'Azur - we recommend you visit our online partner, Rentalcars. Nice has a delightful Mediterranean climate which means it’s mild and brilliantly sunny for most of the year - excepting winters which are cool and sunny. The Mistral winds keep Nice from baking during the summer months, and keep the rain showers moving, so that Nice gets passing showers rather than days of rain on end. If your aim is to escape the crowds - and Nice is the second most popular destination in France - then it’s better to come in the shoulder seasons, spring and autumn, though winter is very pleasant too if you’re not here to swim. Still not sure which is the best place to stay in Nice for you? Ideally located gem in the old town, with exceptionally pretty bedrooms. Chintz wallpaper, large sash windows and some with small balconies give a wonderfully 'french chic' air. Breakfasts served in the garden. Access to a private beach. A well priced city base. City Style - French finesse in bucket loads in this charming hotel near the sea. Cooking classes - Buy produce from the local market and then master the art of French Cuisine with Christian Plumail. 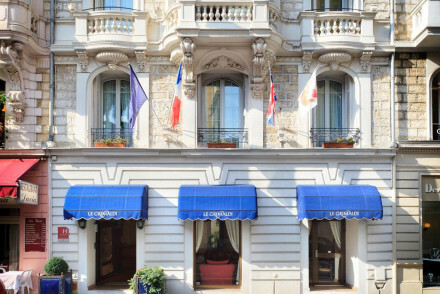 This four-star hotel is situated in the heart of Nice. 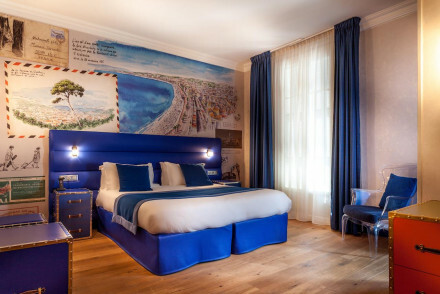 The décor of the rooms draws inspiration from the neighbouring Nice-Ville train station, with postcard theme walls and travel trunk design pieces; book a family room for extra space. Enjoy a drink at the cosy courtyard bar; a charming hotel. A historic hotel that exudes a classic old-world Belle Époque charm with a contemporary twist. Bright rooms feature fine bedsteads, pretty patterned wallpaper and smart contemporary bathrooms. The atmospheric bar has a homely feel. A memorable base. A charming hotel in a Belle Époque building oozing feminine glamour. Expect classic furnishings, quirky wallpapers and potted plants in the chequered black-and-white tiled lounge area, while rooms have luxurious fabrics and lovely walls featuring a gilded bird-of-paradise pattern. A gem! 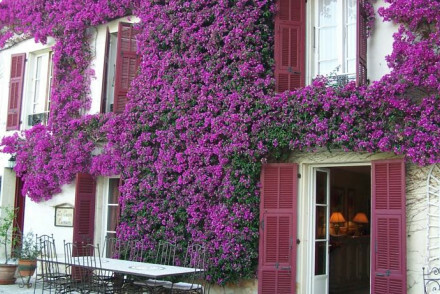 Delightful B&B in a bougainvillea-clad villa above Nice, with lush gardens, a small pool and seaviews. Very pretty Provencal bedrooms, light and airy with terracotta tones. Plenty of outdoor corners to curl up with a book. Well placed and good value for the area. Charming. Hideaway - Ideally situated in the hills above Nice, recharge your batteries in the leafy gardens before heading down to the madness. Local markets - Take a stroll through the fragrant morning Flower Market at Cours Saleya. Sights nearby - Discover the remains of the ancient Roman city of Cemelenum. Eclectic and quirky hotel with original decoration and an exotic garden. Good value, set back from the seaside but within walking distance of all Nice has to offer. Rooms decorated, some wackily, by local artists. Laidback and informal with plenty of character and charm. 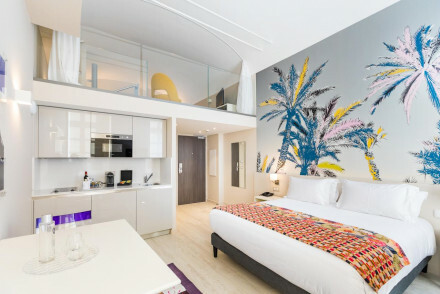 City Style - This stylish hotel with rooms designed by contemporary artists, is perfectly located for absorbing the nightlife and beaches. Total relaxation - Chill out in the shady garden, take a dip in the hotel pool and avail of the on site spa treaments and hammam. Great walks - You'll have great fun exploring the narrow, cobblestone pedestrian streets of Vieille Ville de Nice, just 900m from the hotel. Local markets - Check out the Monday morning antique market on the Cours Saleya. 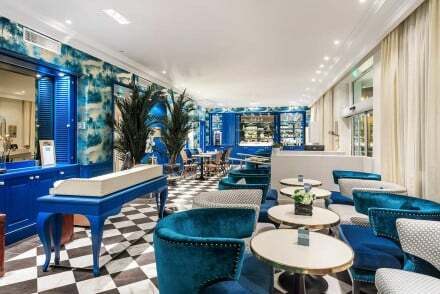 A charming Gatsby-themed hotel offering great breakfasts. Expect suitably bold (yet tasteful) interiors, featuring Chesterfield sofas, plush blue velvet and bold floors, with a swanky bar to boot. Rooms have great statement wallpaper in shades of turquoise and chic furniture. A quirky, fun base! A sophisticated hotel on a smart plane-tree lined boulevard with great views from the higher balconies. Modern interiors have plush velvet furnishings set in grey tones, large windows and elegant yet simple decor. Chic rooms are equally polished. A tasteful base. Charming villa accommodation high in the hills above Nice. The four elegant rooms have soft hues and modern artwork. A large pool has lovely sweeping views. Indulgent breakfasts and friendly owners and hosts. A lovely spot to explore the French Riviera from. Local markets - Nice’s famous Flower Market is well worth a visit. A good Four Star option in the centre of Nice. Contemporary rooms with all the mod cons, fabulous rooftop pool, and a rooftop restaurant with panoramic views serves local cuisine. Spa, therapeutic treatments, and its own private beach and beach bar less than 1km away. Views - Stunning views from the rooftop deck and pool. Traditional - 1920s Belle Epoque architecture. 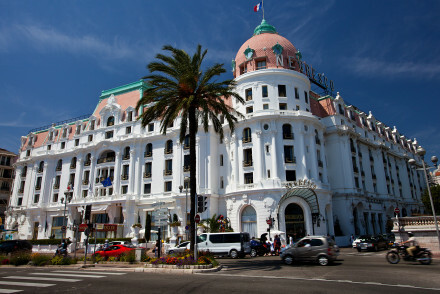 The luxurious Negresco Hotel is centrally located in Nice, a short distance from the beach. Feel like a VIP in their opulently decorated and spacious rooms which fuse antique furniture with bright colours-a unique experience! Be sure to try their Michelin 2* Le Chantecler restaurant. A divine stay! This chic, intimate hotel exudes old-school charm. The peachy façade, blue shutters and sea view rooms are utterly picturesque. Elegant bedrooms have a traditional feel, yet are fresh and unfussy. Perfectly located in the heart of the postcard-pretty town this is a convenient and stylish stay. Value chic - Beautiful historic façade, stylish rooms and breathtaking views of the French Riviera creates the feel of a movie set! 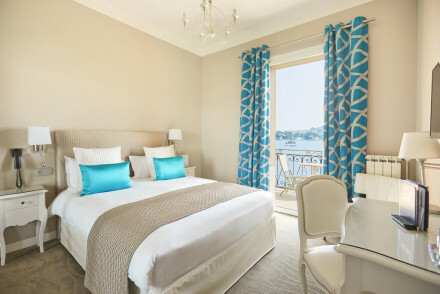 Charming and discreet hotel with pool set back from the Promenade des Anglais with classic Bay views. Well positioned for the port, markets and downtown, the beach is across the road. Lovely patio restaurant and pretty bedrooms, the best with terraces. Well positioned to explore the city. Beach Life - Lovely seafront hotel well placed to explore the city, perched right on a cliff and just steps from the beach. Sights nearby - Marvel at the the monastery of Cimiez and beautiful rose garden overlooking the city and Castle Hill. Local markets - Very close to the Marche du Fleurs, a vibrant and colourful way to spend your morning. 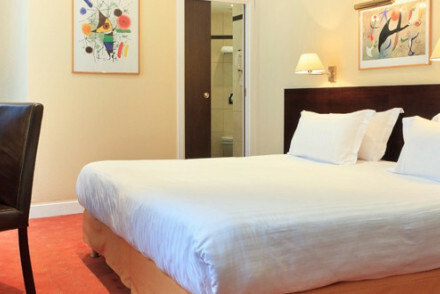 A plush and modern hotel featuring large soundproof suites offering guests both calm and comfort in the heart of Nice. Rooms have a Scandi-chic style with natural materials set against soft grey hues and the best have free-standing baths. A delicious continental breakfast is served. Superb! 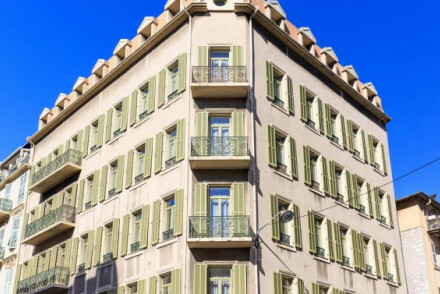 This boutique hotel occupies a renovated 18th-century palace in the heart of Nice. Suites are dressed in a contemporary style with bold design pieces and bright prints. All suites offer separate living space and spacious self-catering apartments are available for groups. A unique and stylish hotel. 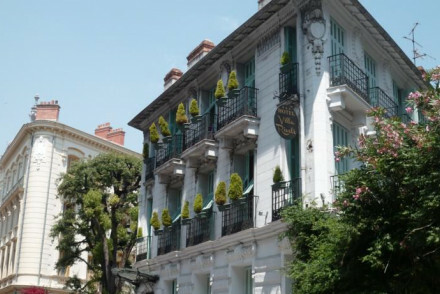 This charming, four-star hotel is situated on the seafront in Nice. Rooms are bright and airy, with wooden floors and crisp, white linens. The best suites offer a private terrace; book a Privilege room for panoramic sea views from the French windows. Relax in the friendly hotel bar. A stylish stay.